PUNE: The Aam Aadmi Rickshaw Sanghatana, a union for auto-rickshaw drivers formed by the AAP, has asked its members outside the Pune railway station to ply only by the meter to win back customers as auto-rickshaw drivers, notorious for fleecing passengers, face stiff competition from app-based cab services. The drive, which entered its 12th day Tuesday, has been received well by people and the union plans to launch similar drives outside the Shivajinagar railway station and also in Nagpur. Passengers alighting at the Pune railway station, especially those going to peripheral areas or alighting at odd hours, often find themselves at the mercy of auto-rickshaw drivers, who refuse to go by the meter and overcharge. In recent years, the entry of app-based cab services like Ola and Uber have posed stiff competition to their business as more and more passengers prefer to hail cabs on their smart phones, drawn by their fares, comfort and the ease of hailing them without having to haggle with the drivers. Shrikant Acharya, of the AAP autorickshaw union, said they decided to take up the drive to gain back customers. 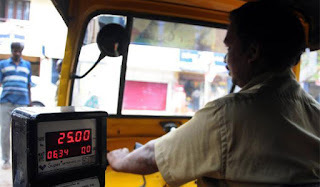 “Thanks to the entry of app-based players, autorickshaw drivers have lost significant business. At key locations like the Pune railway station, most of them can be seen idle for hours and when a passenger comes their way, they try to overcharge,” he said. “Our initiative is simple - we are encouraging drivers to ply only by the meter. If they ply by the meter, they would in due course get a steady flow of customers and not run in losses,” he said. To this effect, the union has put up a banner outside the railway station, pledging to ply only by the meter. Sadanand Patil, an autorickshaw driver and a member of the union, said the response has been positive. “On an average, we are getting 2,000-3,000 customers now and the numbers are rising,” he said. Office bearers of the union are manning the booth outside the station to help customers and manage the queue. Asked if they had faced any opposition from other auto-rickshaw drivers, Sadanand replied in the negative. “We encourage them to also ply only by the meter,” he said. This move, he said, will help them win back lost business. Both Acharya and Ankush said the move had caught the fancy of other autorickshaw unions. “An organisation from Shivajinagar has approached us to start a similar drive there. Talks are underway in Nagpur to replicate it there,” Ankush said. The union aims to use technology to leverage customer experience and help autorickshaw drivers get more business. Sadanand said they were in talks with the district collectorate to develop an app for autorickshaws. “Also, we are developing a software to track rides as well as get feedback,” he said.